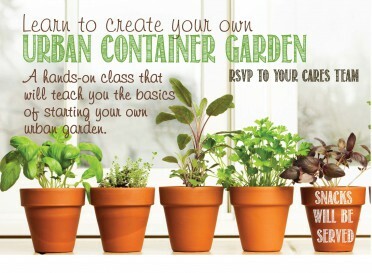 Here is an awesome class that many of the CARES Teams across the country are doing called Urban Garden. Living in an apartment definitely doesn't mean you can't have a garden; reach out to your CARES Team and RSVP for this hands-on class that you won't want to miss. Just imagine it now, fresh picked herbs (and more) for all of your home-cooked meals. You can't beat that!